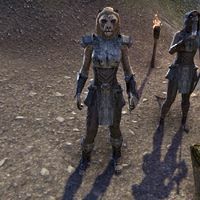 Captain Rahiba is a Khajiit civil servant who can be found in Mistral below the bridges where she appears to be investigating a suspicious death. When you talk with her she will warn you away from the crime scene. "Please, take care where you step. Whoever killed this man may have left something behind." "Not yet. We might blame the storm if not for the bruising around his neck. Whoever did this was very strong." Do you know why he was murdered? "That much is obvious. This man is affiliated with the Crosstree, a group of smugglers that runs skooma to Mistral. What's strange is the manner of his death." "We find bodies from time to time. Sugar fiends who fail to pay the Crosstree. Occasionally the smugglers themselves. Usually stabbed in the back, a pair of crossed lines cut into their faces. This man bears no such marks, nor was he stabbed." "Not sure yet. Perhaps one of their clients has taken issue with them, or maybe they have a new competitor. It is difficult to tell with criminals. Rest assured, we will find out what happened here." "He bears the colors of the Crosstree and skooma was found on his person." This page was last modified on 8 March 2019, at 10:20.